Three years ago, the 82-year-old president of Egypt, Hosni Mubarak, stepped down amid historic protests against his dictatorial rule. News of his resignation on Feb. 11, 2011 marked the climax of an uprising that was quickly recognized as one of the most sudden and significant upheavals of the 21st century. As the New York Times reported, "The announcement, which comes after an 18-day revolt led by the young people of Egypt, shatters three decades of political stasis and overturns the established order of the Arab world." Activists in Egypt, along with sympathizers throughout the world, rejoiced. "We had tried before. But nothing was like this," said Ahmed Salah, a veteran youth organizer who had worked for years to drum up resistance to the regime. For months, he had been promoting the audacious and improbable idea of a revolution without arms. "I had hopes, but I never really thought that I'd see it," he explained. "Tahrir brought tears to my eyes." Today, the euphoria of those times is gone. The military, now under the command of General Abdel Fattah al-Sisi, is back in charge, having ousted the elected, Muslim Brotherhood-led government of Mohamed Morsi last July. Prominent political scientist Amr Hamzawy describes his nation as "a country in fear" that is now experiencing a "fast recovery of authoritarianism." Amnesty International concurs. In a recent report the human rights group argued, "Three years on, the demands of the ‘25 January Revolution' for dignity and human rights seem further away than ever. Several of its architects are behind bars and repression and impunity are the order of the day." The report further contends, "The Egyptian authorities are using every resource at their disposal to quash dissent and trample on human rights." These troubling developments raise some critical questions: Did nonviolence fail in Egypt? And, if so, what can be learned from the country's experience? Egypt is often held up as a success story of civil resistance -- a fresh and exciting example of how a nonviolent mass mobilization can prevail over a force with far greater military might. However, as the country has slid back into a repressive and undemocratic state, this success has been called into question. Some regard the situation in Egypt as worse than ever, and the most cynical contend that it would have been better if the revolution had never happened at all. In fact, the Egyptian revolution should been seen neither as an uncomplicated success nor a mere staging ground for pessimism. For it is far more valuable when recognized as something different: a perfect case study both of what can be accomplished by mass mobilizations that harness the power of disruptive protest -- and of the limits of these mobilizations. Beyond "a tightly knit and hierarchical structure"
To understand how the political situation in Egypt has unfolded, it is useful to first ask a more basic question: How did a small, loosely organized group of Egyptian young people end up setting the terms for their country's revolution? If anyone should have spearheaded a successful revolt against Mubarak's rule, it was the Muslim Brotherhood. Founded more than 80 years ago, the group was banned in Egypt in 1954 and operated underground for decades. As a result, estimates of its membership have been imprecise, but the count reaches into the hundreds of thousands and may be as high as a million. Moreover, the organization's influence extends beyond its membership rolls. The Muslim Brotherhood established a strong reputation as a social service provider, operating a nationwide network of schools, food banks, hospitals and programs for orphans and widows. While the Mubarak regime worked at turns to repress or contain the Brotherhood's political activities, it tolerated these charity efforts -- recognizing them as an essential supplement to the state's fraying social safety net. As public health researcher Nadine Farag reported in 2011, an Egyptian woman, regardless of politics or religion, could pay the equivalent of $175 to give birth in a well-staffed and well-equipped hospital run by the Brotherhood, or she could pay $875 in a private hospital. Farag further notes that, when a devastating earthquake hit Cairo in 1992, the Brotherhood quickly provided tents, food, tea, blankets and makeshift medical clinics, solidifying its reputation among the Egyptian public. While still officially banned, the Brotherhood gained a foothold in parliament in 2005 with its candidates running as independents. Although not a member of the Muslim Brotherhood himself, Salah, one of the youth leaders during the Tahrir uprising, nevertheless described the organization as "by far the largest and best-organized opposition group in Egypt," a formidable social and political institution with members "organized into a tightly knit and hierarchical structure." Although it may seem strange, the same factors that made the Brotherhood powerful -- the strengths of its organizing model -- also made its leaders hesitant to risk all they had built in a mass confrontation with Mubarak. After all, they had something to lose. Because the Brothers had clearly identified leadership and hierarchical membership, they were easily targeted for repression by the state. Because they had created strong structures through which they could patiently amass power, they felt less urgency to force a public crisis for the regime. And because they were experts in person-to-person networking among their Islamist base, they were less adept at advocating for widely popular political demands that would be supported by other segments of society. This pattern is not unusual. From the U.S. civil rights movement to the "color revolutions" in the former Soviet bloc and the Occupy movement, one can see a similar scenario play out: the most established, well-structured organizations on a given political landscape are taken by surprise by little-known upstarts who launch nonviolent rebellions that capture the public imagination. These new groups have far fewer resources and much weaker institutional structures than conventional labor unions, community-based organizations, or political parties. But they use these traits to their advantage by organizing outside of the structure of any traditional dissident group. They specialize in a different type of social movement activity: momentum-driven mass mobilization. This type of protest activity goes by different names. Sociologist Frances Fox Piven calls it the exercise of "disruptive power," distinguishing it from the typical practices of membership organizations. Historian Charles Payne, identifying two different strains within the U.S. civil rights movement, calls it the community mobilizing tradition -- a lineage "focused on large-scale, relatively short-term public events" such as the famous campaigns in Birmingham and Selma -- which he contrasts with the patient community organizing and local leadership development carried out by the likes of Ella Baker. A relatively new academic field devoted to the study of "civil resistance" has begun exploring in depth the dynamics of mass, unarmed uprisings -- building upon Gene Sharp's pioneering studies into strategic nonviolent action. In each case, the groups on the disruptive side of the equation look a lot less like the Muslim Brotherhood and a lot more like Egypt's scrappy April 6 Youth Movement. Social media-savvy organizations such as April 6 and the followers of popular activist Facebook pages had little in common with the tight-knit cadres of the Brotherhood. While these recently formed groups had tens of thousands of online "members" -- sometimes amassed in a matter of weeks after a high-publicity event -- organizers often knew little more about a given follower than an Internet username. Rather than mastering the arts of long-term leadership development, they focused on confrontation and public spectacle. Their strength was telling stories -- publicizing pictures of police abuse and rallying outrage. The regime gave them plenty to work with. The organizers posted videos of people being beaten by police and showed the wounds of those who had been tortured in custody, the congealed blood from electrocution leaving pink stains underneath the victims' skin. As one example, the "We Are All Khalid Said" Facebook page was named after a 28-year-old man who, in June 2010, was savagely beaten by authorities after posting a video of police misconduct. As journalist David Wolman recounts, two detectives confronted him at a cybercafe and "slammed his head on a table before the owner told them to take the fighting outside. They pulled Said out to a building entryway where they kicked him and smashed his head against an iron gate until his body went limp." When a picture of his dead body was circulated online, it became a viral catalyst for indignation. "Maybe it was because he was a well-known and educated guy with many friends," one student told Wolman. "And the picture. I mean, he was so completely disfigured. I don't know what it was exactly, but it spread like fire." When it came time to mobilize citizens for the January 25 demonstrations, the youth organizers' approach was more akin to concert promotion than the building of neighborhood organizations. They created buzz and generated enthusiasm. Another viral phenomenon was a video blog by 26-year-old Asmaa Mahfouz, a co-founder of the April 6 Youth Movement. Rather than conceal her identity, Mahfouz positioned herself directly in front of her computer's camera and announced that she would attend to the protests planned for January 25. She brazenly implored others to join her: "As long as you say there is no hope, then there will be no hope," Mahfouz argued. "But if you go down and take a stance, then there will be hope." Her testimonial had an unusual impact, inspiring many others to circulate videos of their own. As the New York Times reported, Mahfouz's post "departed from the convenient, familiar anonymity of online activism. More than that, it was a woman who dared put a face to the message, unfazed by the possibility of arrest for her defiance. ‘Do not be afraid,' she said." In contrast to the type of incremental proposals for policy change that might typically be advanced by a political party trying to flex its institutional muscle, the young organizers put forward symbolically loaded demands designed to engender the broadest possible sympathy. Ultimately, they adopted a slogan that had already been made famous in nearby Tunisia: "The people demand the fall of the regime." Instead of turning to established membership lists and mobilizing an already identified rank-and-file -- going deep with a small number of pre-recruited adherents -- the youth organizers went wide. Most of the people that turned out were taking part in demonstrations for the first time. Because of this, organizers' predictions for who would show up were vague at best. Although they had scores of confirmations online and had done extensive word-of-mouth outreach, they could not be certain that more than a handful of people would actually come through. The experience of January 25 turned out to be a marvel. "This was my neighborhood, my home, and during my 10 years as an activist I had met hundreds of people in and around the activist community," wrote Salah, another of the April 6 Youth Movement's founding members, of the feeder march that formed in his neighborhood to head toward Tahrir Square. "Yet the streets were filled with men and women I had never seen. And they were leading chants! As I lifted my voice to join them, I thought to myself: My God! Where have you been? We've been waiting for you!" For a time, the Egyptian media branded all youth organizing as the work of April 6. This reflected the group's success in creating a type of mobilization that was less a concrete institution than an open movement, one with which people across the country could identify. According to Salah, the group had only a few dozen physical members as of early 2011, and yet a wide range of autonomous activity was popularly associated with the organization's efforts. "It became the brand name," Salah said. "We were successful in making it the icon of change." Not only did the youth propel several early demonstrations that filled city squares in Cairo and beyond, they exerted lasting influence as the protests grew. When, several days in, groups such as the Muslim Brotherhood and National Association for Change -- led by the Nobel Laureate and former head of the International Atomic Energy Agency, Mohamed El Baradei -- finally decided to amplify a political eruption that was too large to ignore, these experienced actors showed deference to the methods and the messages that the young people had established from the outset. Foreign policy analyst Robert Dreyfuss explained, "When the Egyptian uprising began in January, the Muslim Brotherhood was not among the leaders. At the forefront of the movement were young Egyptians… joined by a panoply of secular, socialist, Nasserite, and pro-democracy groups, and eventually by Mohamed El Baradei." The new groups that signed on overwhelmingly adopted the slogans and framing of existing revolt. As the revolution commenced, the reliance on momentum-driven organizing was not a limitation. Rather, April 6 and other youth groups were able to spark a contagious uprising precisely because they were not based on rigid structures. They did not have organizational assets that could be seized by the regime. They did not have established political turf to defend or sectarian interests that would make them be seen as a self-interested, partisan effort. They did not have structures that could be easily infiltrated. And so they could take on a broad-scale, symbolically loaded campaign, geared toward maximum support and maximum disruption. 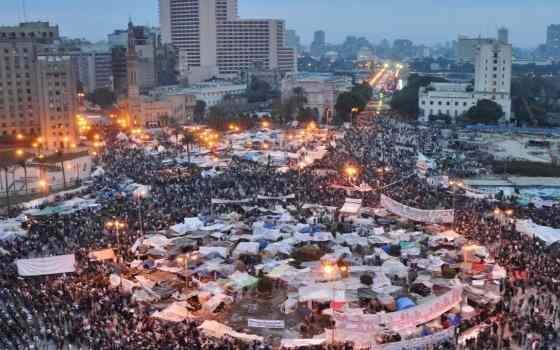 Certainly, on February 11, 2011, when authorities announced Mubarak's resignation and the activists cried with joy in the square, storm clouds already loomed on the horizon. Over the next three years, the nonviolent insurgents would face a mountain of challenges, a resurgence in repression and the specter of counter-revolution. But for the moment, they accomplished something that few in the world could have predicted and something the best-organized group in the country could not: They unseated the tyrant who had ruled for longer than many of them were alive. "We don't know how to compromise"
Rallying mass public sympathy, bringing people onto the streets in staggering numbers by "breaking the fear barrier" -- as a popular expression among Egyptian activists puts it -- and ousting an entrenched regime are all remarkable accomplishments. They should be recognized as such by future movements, and their dynamics should be studied and the strategies mined. Yet, just as the momentum-driven organizing model of April 6 and other youth groups gave them disproportionate influence in shaping the uprising, the well-engineered structures of the Muslim Brotherhood proved critical in defining what would come next. The challenge after any mass uprising is to institutionalize the gains of disruptive power once a peak moment passes. Here the habits of structure-based organizing become very useful again. One such habit relates to how a movement presents its objectives. Momentum-driven groups thrive on broad, transformative demands that have symbolic resonance and can inspire support from the general public: "The people demand the fall of the regime." In Egypt, this sweeping call to action created a crisis of legitimacy for Mubarak. But it was not nearly as effective in ensuring the rise of new leaders or new systems of governance. In contrast, groups like the Muslim Brotherhood specialize in pursuing transactional demands -- narrower, more incremental gains that play to their base and allow them to leverage the institutional power they have accrued. The conventional route to winning this way entails horse-trading, insider access, and compromise. It's a famously messy process. Not surprisingly, the skills of political butchery and legislative charcuterie are not strengths for decentralized networks whose passion is energizing people who would have never before seen themselves joining a demonstration. Wael Ghonim, the administrator of the "We Are All Khalid Said" Facebook page and author of the book Revolution 2.0, took it as a point of pride that the site did not sink into the muck of party politics but instead focused on "universal" issues such as freedom and human rights. In the Oscar-nominated documentary The Square -- released in late January to coincide with the third anniversary of the revolution -- two youth leaders discuss how this became a problem after the fall of Mubarak: "Politics is not the same as a revolution. If you want to play politics, you have to compromise. And we're not good at this… at all," said Khalid Abdalla, a British-Egyptian activist and actor known for his role in The Kite Runner. "We don't know how to compromise." "We're terrible at it," agreed Ramy Essam, a musician who performed regularly before rallies in Tahrir, earning renown as the "singer of the revolution." This was not the case for the Muslim Brotherhood. For its leaders, negotiating for institutional advancement in a post-revolutionary climate came naturally. With the framework for a political party already in place and an organized bloc of voters at the ready, the Brotherhood moved to the fore. While young liberals generally favored allowing time for the drafting of a constitution and the formation of new parties, the Brotherhood pushed for quick elections. Abdul-Fatah Madi, an Egyptian analyst writing for Al Jazeera, explained that prior to Mubarak's defeat the youth-led factions "preoccupied themselves with acquiring knowledge on how to topple tyrannical regimes as well as spreading information about human rights violations." But as the post-revolutionary transition began, they failed to "familiarize themselves with the intricacies of state-building and political projects that would serve as an alternative to the authoritarian regime." The young people, Madi argued, showed an aversion to haggling over long-standing partisan demands, a disinterest stemming "from not wanting to participate in the decision-making process, which was dominated by old parties and the long-standing elite." In the absence of a structured challenge by the secular revolutionaries, the Muslim Brotherhood dropped any pretense of a movement coalition. Six months after the revolution, it ordered its members out for mass rallies. The disciplined crowds chanted "Islamic rule, Islamic rule," and "The Qur'an is our constitution." The youth, the champions of momentum, had been outmaneuvered. "A new revolution all over again"
While Egypt's predicament has some distinctive characteristics, it is not unique among recent upheavals that have unseated undemocratic governments. These include the "color revolutions" in the former Soviet bloc and the movement that forced Slobodan Milošević from power in Serbia in 2000. As in Egypt, students played a critical role in leading quickly swelling mobilizations. But in all these cases, the youth were unprepared for later events. Matthew Collin, author of The Time of the Rebels, a study of these uprisings, writes that there "seemed to be no blueprint for what, if anything, these youth movements could achieve after their revolutions." The leaders of some groups joined government agencies, some attempted to become political parties, and others tried to remain intact as outside watchdogs. But given that it is impossible to maintain high levels of mass mobilization forever, Collin explained, "In all cases, most of the rank-and-file activists simply drifted away. They could help to change their countries, but they found it harder to ensure that the politicians who came to power afterwards remained true to the principles they had espoused at the moment of revolution." The momentum-driven efforts achieved some lasting changes -- such as the establishment of regular elections in Serbia -- but older elites were able to use their institutional strength to bore back inside the walls of power. Ideally, when structure-based organizing and momentum-driven movements are aligned, the two models can complement one another. Established groups that share the goals of a mass uprising can benefit from a burst of increased energy and interest in a shared cause. In turn, the more established organizations can lend their prestige and resources to outbreaks of resistance when they arise. This happened in Egypt when the Muslim Brotherhood decided to back the Tahrir revolt -- bringing microphones to the square, turning out its members, arranging garbage collection -- and when it joined the push for a coalition government. But when the constituencies split, when the secular revolutionaries were at odds with the Islamists, the army became the main beneficiary. The armed forces, which refused to crack down on behalf of Mubarak to wipe out the January 2011 uprising, were perceived as heroes after the revolution. The military thus emerged as the force that would control the structures of the old regime, and it would compete with the Muslim Brotherhood for dominance. Over the next year and a half, when the Supreme Council of the Armed Forces attempted to hold on to power, reinvigorated protests -- brandishing the slogan, "A new revolution all over again" -- forced them to cede to civilian rule. This allowed the Brotherhood's Mohamed Morsi to take office as the country's first democratically elected president in the summer of 2012. However, during his year in office, Morsi would grant himself ever-more-expansive powers, prompting a public backlash. Having already dethroned Mubarak and the Supreme Council, Egyptians took to the streets to rally against a third ruling power. Graffiti artists changed their stencils: those who once marked red Xs over spray-painted images of Mubarak began using cutouts of Morsi instead. In the summer of 2013, amid anti-government protests even larger than those that started the revolution, the military stepped in and forced the Muslim Brotherhood from power. At first, liberals were hesitant to call it a coup. But hopes for more open and pluralistic governance were once again thwarted. In following months, the army escalated repression, cracking down on both its Islamist and secular opponents. By the revolution's third anniversary, when Amnesty warned of authorities "using every resource… to quash dissent," things looked bleak indeed. Should we conclude from today's vantage point that nonviolence has failed in Egypt? The challenges of establishing a more free and just social order after a revolution are hardly unique to nonviolent movements. They afflict all turbulent changes of state power. Studies have found that, in the past several decades, when a regime has been toppled, the post-transition states have been far more likely to become democratic when the transition was led by coalitions employing tactics of unarmed civil resistance -- strikes, mass boycotts, and large-scale demonstrations. In the case of a guerrilla uprising against an undemocratic state, the chances of open and participatory government are far slimmer. Here, revolutionaries still have to fill the vacuum left by the old regime. But since the armed force that instigated the overthrow is usually the best-organized institution of the resistance, its hierarchical structures are primed to take over. The result, as in many post-colonial African states, is often a new military government. Since Morsi's ouster, militant Islamist groups have carried out shootings and other attacks against government security forces -- including two high-profile bombings of the police headquarters in Cairo. Although the Muslim Brotherhood has issued statements condemning the attacks, the army has used the violence as occasion for a brutal crackdown on dissidents. In December, it declared the Brotherhood a "terrorist organization," outlawed all participation in its protests, and froze the assets of at least 1,055 affiliated charities. Unfortunately, the pretext of a "war on terror" has allowed the military to retain considerable popular support. Some of those who took to the streets on January 25, 2011 may have been morally opposed to violence. But, as a whole, the people of Egypt opted for unarmed mass demonstrations over joining a guerrilla struggle for one simple reason: They believed strategic nonviolence was the more practical and effective means of ousting the heavily militarized Mubarak regime and achieving a more free and participatory society. The results of attacks by insurgents in the past six months, which have hardly served to weaken the army's hand, suggest that the tactical judgment of nonviolent revolutionaries carried considerable wisdom. Despite current difficulties, the strategy of unarmed mobilization also contains hope for the future. Given the developments of the past three years, one might think that the revolution has been discredited in Egypt, that the Tahrir uprising might be denigrated or forgotten in the popular imagination. That is not the case. Instead, the revolution stands as a celebrated cultural touchstone. Rather than attacking it, each of the groups vying for power in the country tries to claim credit for ousting Mubarak and presents itself as the force that is carrying forward the true spirit of the revolution. This is true of the army, which, one reporter writes "wrapped its takeover not only in the flag, but also the original 2011 uprising." When jailing secular revolutionaries or members of the Muslim Brotherhood, the military paints them as traitors to the popular cause. Emergency police state measures to combat terrorism, the generals contend, is the only way to preserve what they call the "glorious" revolution. Those who led momentum-driven mass mobilizations in Egypt have yet to solve the problem of institutionalization. Developing structures that can absorb the gains won by disruptive outbreaks will take time. Youth organizers now recognize this: In 2012, leaders of the April 6 Youth movement vowed to embark on a five-year plan to develop alternative institutions. At the same time, they also recognize that their uprising has unleashed a spirit of communal self-determination that cannot be easily subdued. "Our revolution's weapon is our voice," activist Ahmed Hassan explained to the filmmakers of The Square. "If you ask me, ‘What is the revolution's biggest victory?' It's that today kids play a game called ‘Protest,' where some kids are playing the revolutionaries and others play the police or army or Muslim Brothers." For his part, April 6 co-founder Ahmed Salah is now living in exile and dealing with the trauma of repression. "I feel that this is the worst time," he said. "Most people have been brainwashed into thinking that the only way to save Egypt is through military rule." And yet he reports that his pessimism is balanced by another impulse. "I also feel confidence," Salah said. "Each group that has been in the leading position in the country has tried to retain power. Yet we Egyptians were able to bring down three regimes: Mubarak, the Supreme Council, and the Muslim Brotherhood." "What we did before," he concluded, "we can do again." "Did Nonviolence Fail in Egypt?"